One of the features of the English novel is the transition period (1880- 1920) is the progressive decline of the hero. It is not the purpose of this research to investigate why this should have taken place, but several critics have put forward their own interpretations of this phenomenon. It may be the decreasing stature of the authoritarian father figure in the fiction of the transition period linked to the decline of the hero. The fact that England was ruled by a queen, who was openly referred to as the "Mother" of the country, is probably important. What I have tried to do in the pages that follow is to show that the image of the great male figure underwent considerable change in D.H. Lawrence's autobiographical novel Sons and Lovers. Lawrence's outlook on life is not much different from that of his contemporaries. He, too, is interested in the study of man and the record of the human experience. He believed in the individuality of man and his right to establish world according to his own world according to his line of thought. In Sons and Lovers (1913) D.H. Lawrence attacked not only the Victorian society, but also the Victorian family. Perhaps his personal experience as a son of a collier motivated him to write about the miners and their painful life. Because of his parents unhappy marriage, D.H. Lawrence denied all social bonds. He believed in the freedom of the individual: "Each (man or woman) must be true to himself, herself, his own manhood, her own womanhood, and let the relationship work out of itself." Mrs. Morel in Sons and Lovers was a proud, highly-cultured woman, married beneath her to Walter Morel a vigorous miner. This marriage did not bring her the happiness she had dreamt of. On the contrary, she became one of miserable wives we often encounter in fiction. had a rich fund of humor, but it was satiric. intellectual, warm, a kind of gamboling. Walter Morel himself was greatly fascinated by Miss Coppard. "She was to the miner that thing of mystery and fascination, a lady". Therefore, they soon married and led a happy life for a few months. But the realities of daily life soon exposed them to each other, each day brought a new revelation about the true nature of the other. The major shock that Mrs. Morel encountered was her discovery that her husband was a liar. He lied to her about his owning of the house. Morel's attachment to his family is seen in two significant incidents: first, when Paul had an attack of bronchitis, Morel came to see him. But Paul reacted passively to his father's presence; secondly, when Mrs. Morel fell ill, Morel showed care and attention: he made her tea and begged her to drink it; he also cleaned the floor. All his good intentions were overlooked by his wife and sons, who tried their best to destroy him. Dorothy Van Ghent sees that the Sons and Lovers "has a structure rigorously controlled by an idea of an organic disturbance in the relationship of men and women-a disturbance of sexual polarities that is first seen in the dissatisfaction of mother's attempt to substitute her sons for her husband". One may easily see that the clash between Mrs. Morel and her husband was not only a class conflict; it was rather a cultural one. Socially speaking, Mrs. Morel is superior to her husband. She "came of a good of burgher family, famous independents who had fought with Colonel Hutchinson, and who remained stout Congregationalist. Her grandfather had gone bankrupt in the lace-market at a time when so many lace-manufacturers were ruined in Nottingham. Her father, George Coppard, was an engineer". But as things did not go well with him, he financially deteriorated. Therefore, he became a foreman of engineers in his town. Culturally, Mrs. Morel was also superior. She did not only go to school, but also had the chance to get in touch with the educated men who used to come to the family house. Those significant differences were sufficient reasons for destroying the Morel's marriage. 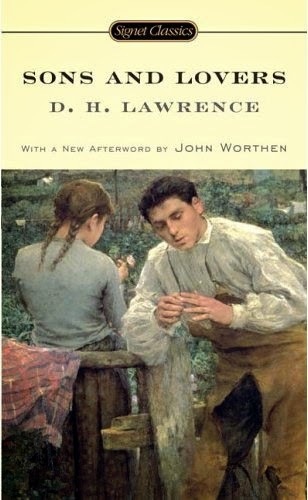 Lawrence was aware of the absurdity of the Morels' marriage, but as he experienced a similar life, therefore, he was encouraged to write this autobiographical novel. Walter Allen shows that Lawrence's main problem was "to express emotions, Feelings, as they exist far beneath the surface of gesture”. As a psychological realist, he succeeded in creating such emotions in Sons and Lovers, but they were not normal. In fact, possessive love, as well as extreme hatred, can not be normal because they have a devastating effect on the development of the individual. In Sons and Lovers the relationships among the members of the family were characterized by exaggeration. Perhaps Lawrence intends to create an impulsive effect in the readers against all social bonds-like marriage ties. To him, the relationship of man and woman is the central fact in actual human life. But this relationship could not continue unless it existed between two equal beings. The failure of the Morels' marriage was the reason of the suffering of every member of this wretched family. But the suffering of the father was the greatest because he was an outcast.This feelings of loneliness accompanied him over the years. Mrs. Morel turned to her children for compensation, whereas her husband remained an eyewitness to the collapse of his family. He witnessed the death of his eldest son William, the failure of his third son Arthur, the death of his wife and the unknown destiny of Paul. His decline as an authoritative figure did not occur suddenly, but it happened gradually. Anyway, Morel's suffering was great in his olden age.